10Fold initially opened its new office in the heart of Denver’s River North (RiNo) Arts District, a vibrant business scene full of gifted talent. Shortly after a year, the Denver team outgrew our RiNo location and is excited to announce that we’re moving to a larger space in downtown Denver, just a block from Coors Field (map here). Denver continues to expand its tech hub and startup scene. If the companies and opportunities in the thriving city are not enough to attract talented professionals, the 300 days of sunshine, amazing views of the Rocky Mountains and the fantastic food and brews will. In the last year, our Denver team has grown nearly 50% and see the sky as the limit. Speaking of growth opportunities, if you’re looking to explore a career opportunity in business-to-business, public relations for high tech companies or want to advance your PR career with a company that prides itself on professional growth opportunities and stellar culture, we’d love to speak with you! Feel free to reach out and contact us! Bart is 10Folds VP of Marketing, Operations and Systems and joined 10Fold in 2014. At 10Fold he is responsible for the continued and time critical operations of all practice services systems and reporting. Prior to 10Fold he worked in many National and International marketing positions for 3Com, Extreme Networks, Enterasys and Juniper Networks. Sarah is an award-winning communications professional with 15 years of agency and in-house experience specializing in managing strategic marketing and communications initiatives for business-to-business technology companies. Kimberly has more than eight years of agency experience developing and implementing strategic communications, media relations and social media plans that support internal marketing goals and exceed client metrics. Jackie has more than eight years of strategic communications experience in B2B tech verticals working with clients of all sizes, from Fortune 500 companies to entrepreneurial start-ups, to help drive sales objectives through media relations and content creation to support internal and external audiences. Jake has more than four years of experience in media relations and strategic communications in B2B and B2C tech verticals with companies of various sizes, from early- and late-stage startups to seasoned tech companies. Jake has helped develop and execute communications campaigns for company and product launches, funding announcements, acquisitions and IPOs. Before joining 10Fold, Jake worked with clients in cleantech, telecommunications, aerospace, fintech and security industries. Danielle has been with 10Fold for nearly a year. Danielle is responsible for supporting clients’ speaking and award programs, providing supporting documents, researching industry trends, managing social media and conducting media outreach, across enterprise software, security, big data, AI and IoT industries. Abby joined the 10Fold team in September 2018 as an intern in the Enterprise practice. Abby received her Bachelor of Science in Business Administration with an emphasis in marketing from the University of Colorado Denver. She brings extensive writing and social media experience to the team. 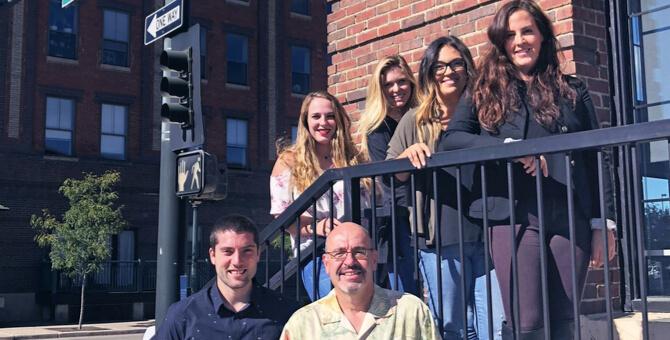 Whether you head up marketing for a complex, technology company or you may want to find your home with 10Fold in the future, stop by and meet our expanding team! Don’t forget to subscribe to our newsletter to get our content and other updates straight to your email as soon as it’s posted!